I have been considering what it would take to tool up and make the glass parabolic reflectors used in the pre-15 gas head lamps. I am an Aerospace Optical Engineer with a background also in Optical Manufacturing so this isn't too much of a stretch for me to tackle. 1) Will the Benson Archives possibly have original drawings of the reflectors even though they were outsourced to Brown and others? 2) Are the reflectors used in the different brands of gas head lamps all the same dimensions? 2) Is there anyone who will be going to the Archives in the near future that would be willing to see if there any drawings there of the reflectors? I figure it would be nice to have a supply of reproduced replacements that are exact copies of the originals. You will not usually find detailed parts explosions (individual parts drawings) of assembly drawings for items purchased outside Ford Motor company. All I have ever found are assembly drawings that would have been used by Ford receiving inspectors. If a part was made by both Ford and an outside supplier you will usually find detailed drawings of each item shown on the assembly drawing. Thanks Ron. I kind of wondered if that wasn't the case. Right now, I have one reflector out of a Brown lamp that Larry Smith loaned me and I am using it for a pattern. What I want to avoid are little detail differences between makers. Back in the 1980's, there was a company in Ohio, named Lancaster Glass Company that made these, I got a pair for E and J black and brass headlights from them at that time. How long have they been out of business? Anyone? I'd buy some. Every time I try to fire up a gas lamp, something messes up the burner and distorts the flame, and the reflector cracks. Jim Patrick - I agree with you and right now I'm just studying the costs involved. I have some of the equipment already for other optical work that I do. The investment may be minimal. The bottom line is quite simple.. it may not be profitable. I am at least going to try and find out. It might be nice to have a extra pair.Our 14 has Victor#2 but? Bud. Gilbert - the original reflectors were made from soda-lime glass. That is very unstable material and heat sensitive. If we were to make these, they would be made from boresilicate, which is a Pyrex (corning-ware) derivative. That should solve the cracking issue. I know my son would want a pair for his car. We looked a while back and came up with nothing. There is also mention of Lancaster Glass on the AACA forum. Apparently they consolidated with another company and reduced their product offerings. 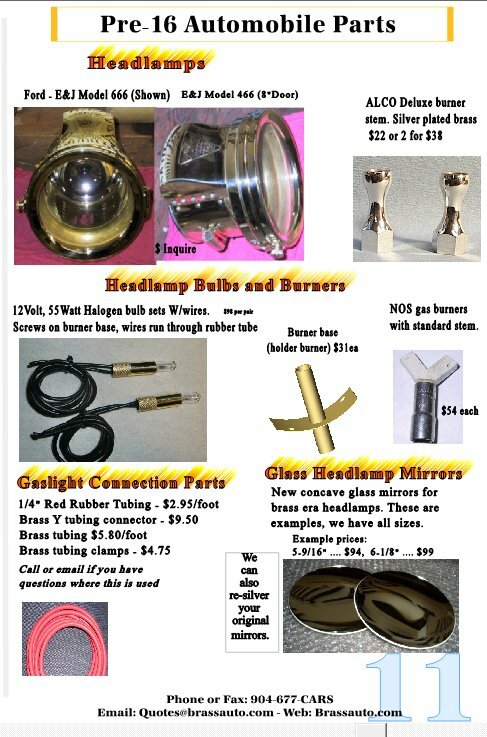 The AACA post mentioned someone was spinning mirrors out of metal and selling them through early Ford part vendors. Last post was 2011. I have sold dozens over the last several years, and they still bring good money. Originals usually have flaws and slight damage. They are hard to re-silver with damage also, and that is an added cost to most originals. I would suggest you do the model T size as that is probably 95% of what is needed and wanted, and the very few people needing a larger size will be able to adapt them. I think if you can make money at $100 apiece, you will sell plenty. All the catalog sellers would likely want to sell them for you , also. Good luck, a much needed item in my opinion. Here is an older post on glass mirrors that Dan Hatch remembered. If you go to Brass Cars website they offer 2 sizes of glass mirrors for under $100. I'd have to see what they offer beyond what is in the picture above. If the photo is representative, those are not exact reproductions of the lenses used in the early ford cars. What I am considering are exact duplicates of the original material. If in fact they are offering exact replacements to the same dimensions as the originals, that price will be hard to beat and not worth the effort. Just sent them an email and asked if they are dimensionally correct. To expand on what Jim Patrick said in a post above, I think there would definitely be a market for Hall stoplight lenses, both the red and the clear license lens. Both can be hard to find, with the clear seeming to be hardest. I might have all the parts for vacuum deposition aluminum. If you get to that step and want to do it in house let me know. I used to make Daguerreotype plates that way, but it became easier touse a cyanide bath. I have also been working on this over the past few years. 99% of places that say they can do these either back out when they get a sample, or the quote is so high that it's just not feasible. The best US quote I got was $120 each in lots of 100. I'd bet that if these are ever in fact made, it will have to be overseas. Frank - I don't plan on optically grinding them either.... it will be way too labor intensive. They will indeed be cast. Chris Olsen - I will keep you in mind. I used to have a coating machine too, a Denton Vacuum model. I'll let you know how I progress. I'm tired of Asian junk. These will be made in my own shop - including the glass casting. We'll see what happens. I would buy at least 6 pair, maybe more. Good luck, hoping this comes to reality. I have a set for Browns and a set for E&J,but the Browns are larger.I would be interested. I would buy a few sets as I have a couple of cracked ones and a pair of lamps with the metal reflectors. The demand is not limited to Model T's as early Maxwells use the same size lamps and there are a good number of them bouncing around in addition to several other makes that used E&J lamps. I have a chipped mirror that needs to be resilvered that I can send you for size comparison if you want it. It is from a Victor lamp and I believe it is the same size as the Brown lamps but do not know if it is also the same as the E&J mirrors. Let me know if you want it and I'll send it to you. I researched Lancaster Glass a few years ago and I was told that everything the company owned had been sold as junk or taken to the dump. I could have gotten some bad advice though. Val - That would be great. I sent you an email with my address.. Thanks! Jack - Can I trouble you provide me with the OD of the E&J mirrors and also the edge thickness? I would be interested in at least one pair for Victor 2 headlamps. They are metric sizes, the largest one is a tenth of an inch smaller then the originals which are 6". I haven't had the chance to see one in person and compare to an original. Larry - thanks for the information. The issue with those is that they are "first surface" mirrors. That means they have the front surface polished but not the back surface. The Model T reflectors rely on the rear surface being silvered so they can be protected with paint. In addition, the edge is not the correct shape to be held the housings. The reflectors will need a positive rake to the bevel. All that being said, these are the closest thing to the original reflectors that are out there. If they had a different edge shape, they could possible be used as a starting point but that just ins't the case. I thought the edge might be he problem. If you are able to start making these please keep us in the loop. If I remember correctly, the ones that I've taken out of Jno. Brown and E&J lamps were identical and made by Bausch and Lomb, with their logo etched near the edge of the mirror. Perhaps, they might have a lead on the correct dimensions. Is the mirror supposed to be parabolic or a spherical radius? I know the reflectors on cars like Model A are a parabola with a close focal point where the bulb filament is located. The Anchor Optic mirror that is 5.9 inches in diameter has a 59 inch focal point which means it would fit in the space allowed but would not be able to correctly focus the light from the burner. Tom Miller - The mirrors are spherical. (Poor choice of words on my part in my first comment) In any event, I used a radius gauge to measure the exact curve. Also, they have to be spherical because if they were parabolic with the light source placed at the focus, the light path would be collimated instead of divergent, which means that the headlights would be illuminating a 6" diameter path of airspace out in front of the car. Eric - I've seen some that don't have any logo at all. 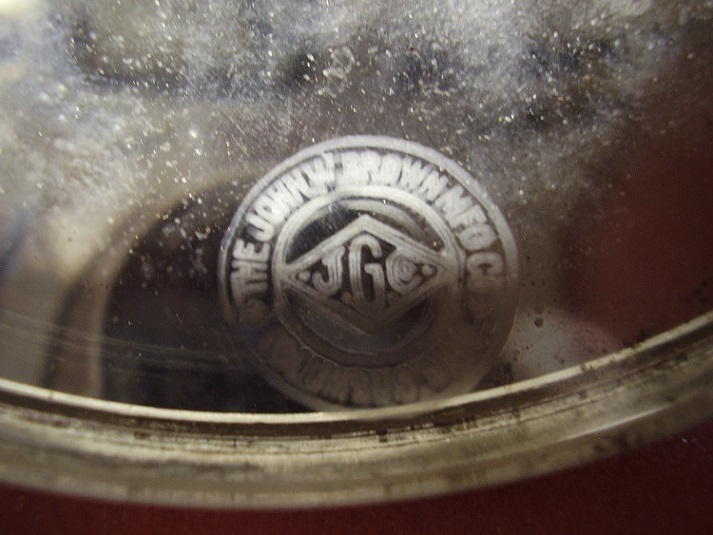 I've also seen some with Jno Brown etched in the glass. They still could all be made by B&L, just with different logo's. Are you thinking of actually casting the glass, or pressing it? Also I should point out the evaporator is home made, but it worked. The toughest part is the vacuum system. They will be pressed. As long as your evaporator throws enough current at the crucible to vaporize the metal, that's all that matters! How large is the bell-jar? I believe headlight mirrors for gas lamps are mangin mirrors (see http://en.wikipedia.org/wiki/Mangin_mirror. At least the originals in my lamps and the Lancaster replacements I purchased many years ago are made this way. A mangin mirror has different curves on the front and rear faces and acts like a parabolic mirror. From all I have read and heard you are correct. Mod with 21c.p. bulb, but nice beam..
James,the larger ones I have measure 6 inches in diameter. The side is 1/8 straight up and then it tapers in to a 5 1/2 diameter. The top surface is 1/8 flat. HTH The tapered surface is 3/8 inch. Chuck - The reflectors do indeed have a slower radius on the rear side of the reflector. THis will be taking into account if I manufacture them. However, for the purposes of automotive gas lamps, the effect would be negligible. Jack - sounds like the same dimension of the examples I have here.... including the bevel dimensions. Dan - Thanks for the link to the article from B&L. Hey fellers- I have a set of these for my '14 Ford and can't determine how they install? May be missing hardware, not sure. Does anyone have a pic or description of how they are held inside the buckets? I need one for my chocolate van. The two I have are not a pair. They have the same dimensions and fit the same way, but one has more curvature. To focus them, one burner has to be forward of the other. Looking directly into the lights, the two mirrored circles look two different sizes. One fellow in Australia was making glass reflectors by slubbing the blanks. The glass was heated until it simply sagged to the surface of the mould. When you speak of casting the reflectors, do you mean pouring liquid glass into a mould, or do you mean forming semi-fluid glass between moulds? 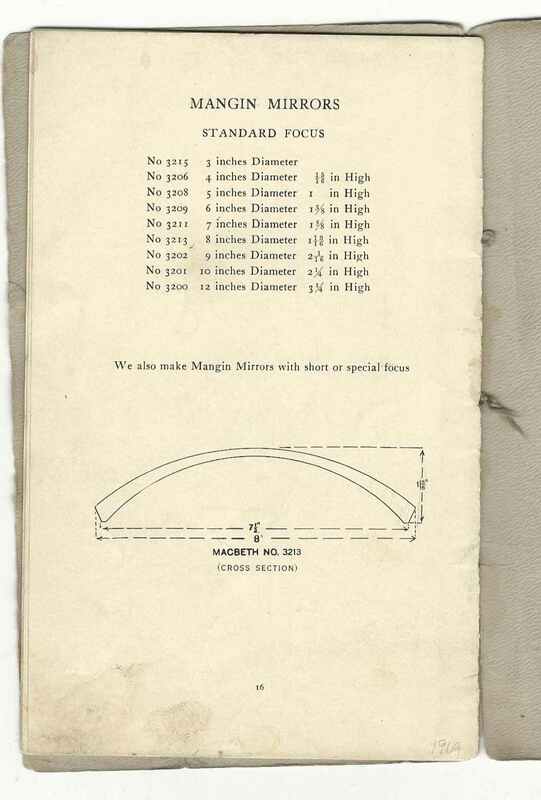 This is the last page of GLASSES for AUTOMOBILE LAMPS catalog No.35 by MACBETH-EVANS GLASS COMPANY, note the reference to other focal lengths. I believe Gray & Davis lamps have short focal length and no doubt others too. Never did a study on the different brands of T lamps but it might be illuminating. If you're going to all the trouble and expense to make these, it would be kinda neat to make them with correct maker's marks if you could. I have a NOS pair of Browns, who obviously used their own, but I think Victors used the Macbeths. Dunno what E & J, Corcoran, or Atwood Castle used. 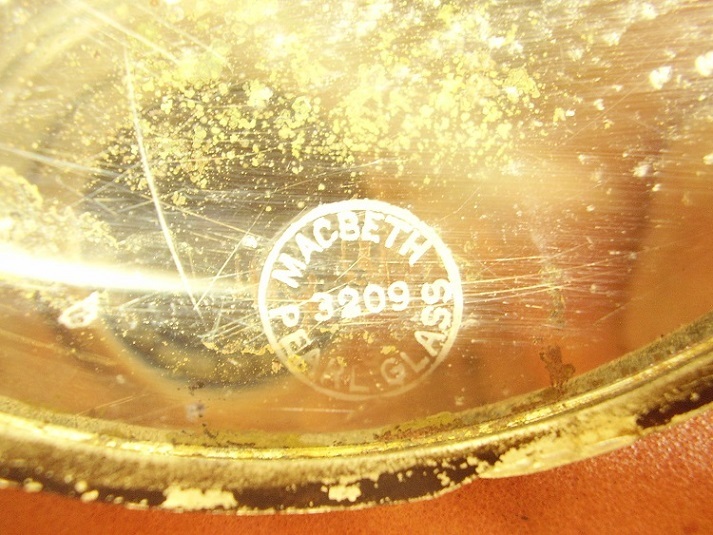 On the actual mirror, the Brown is as clear as the Macbeth; it's just a lousy photo but I can't seem to do any better. What ever happen to this project? I too have a pair of the John Brown script reflectors like R.V. has. They would be neat to make as there seem to be a lot of John Browns around. 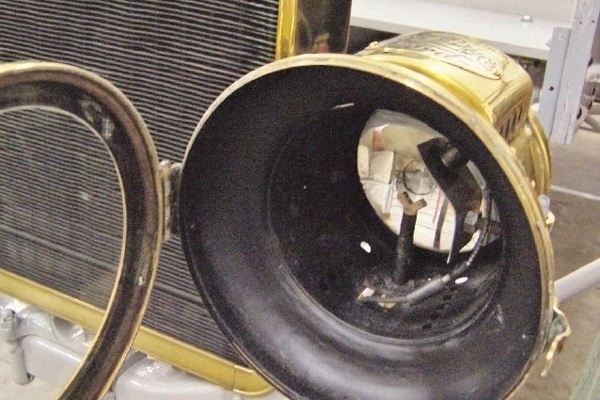 I have a pair of Corcoran headlights on a 1910 Buick Model F and they were just a thin concave glass. I found that curved mantel clock doors worked perfectly. I had them silvered on the back side and made a frame for them. This type of reflector appeared to be the original. I'm going from the looks of the rusty sheet metal rim that was holding them. I had some of the original mangin mirrors and tried to have them re-silvered. They came back looking just like when I sent them in. The folks that did it said the glass was not smooth. Apparently from the asbestos that had held moisture and perhaps residue from burning acetylene which etched the glass??? I believe the E&J's are a smaller diameter. I forget the brand I sent to you, but I tried it in a Brown, and as I recall it fit. The Browns are 6". Hope you do it Jim, we all know there is a market for them.